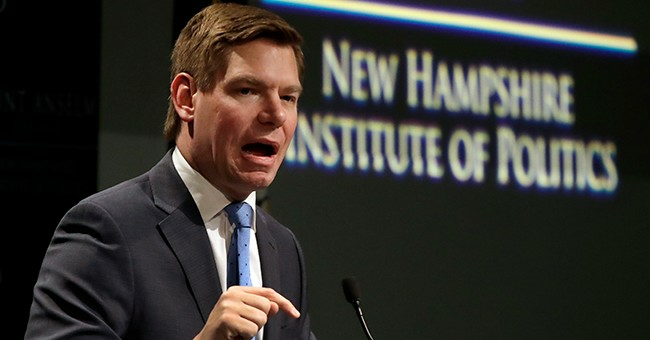 Back in January, Rep. Eric Swalwell (D-CA) didn't even blink when he accused President Trump of being "an agent of Russia." He may have been forgiven, as Robert Mueller's Russia probe was still ongoing. But, it's now over. Mueller concluded that Trump did not collude with Russia during the 2016 campaign. The anchors at "Morning Joe" gave Swalwell a chance to clarify or perhaps walk back his comments on Thursday. Instead, he took the opportunity to double down. “You said even in January on MSNBC when you were asked by Chris Matthews if the president is an agent of Russia, you said yes,” Willie Geist reminded him. "Do you regret saying that? Or you do you still believe President Trump is still an agent of Russia?" Swalwell was adamant he knows all about Trump's MO. He said more of the same in a conversation with George Stephanopoulos earlier this week. Rep. Eric Swalwell on Trump: "He acts on Russia's behalf too often, puts their priorities ahead of ours. Just because he wasn't criminally indicted doesn't meant that he met the standard of conduct." The California rep echoed the sentiments of his fellow Democrats in insisting he won't accept the Mueller report until he hears from Mueller himself. Attorney General William Barr's four-page summary for Congress was "condescending," according to House Speaker Nancy Pelosi. Swalwell is one of the 18 Democratic candidates for president.